Karen Hall moved to Southern California in 2005 to attend Azusa Pacific University. During her time in school she was actively involved in ensembles from chamber music to a touring pop/rock band. She spent four years as principal cellist with the University Choir and Orchestra, touring with them to Korea, Canada and most of the United States. Karen traveled to Brazil with her string quartet performing chamber recitals and giving string workshops and master classes. After winning her school’s concerto competition, she performed as a soloist on the “Kol Nidre” by Max Bruch with the Azusa Pacific University Symphonic Orchestra. Since graduating with her degree in Cello Performance, Karen has kept busy as a freelance cellist, teacher and contractor in the Los Angeles area. Throughout her career, she has worked with artists ranging from Mark Anthony to Tommy Walker and played on a diverse range of stages from Carnegie Hall to the Hotel Cafe. 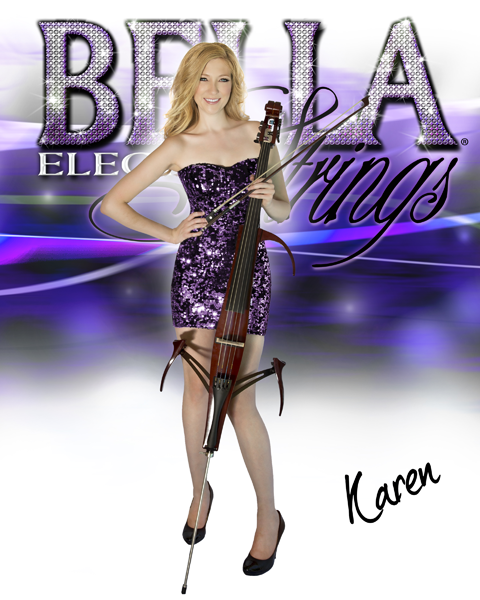 Although a classically trained cellist, most of Karen’s current work is in the commercial field. She can currently be seen as the on-camera cellist for the television show, “Glee” as well as with the Lake Avenue Chamber Orchestra. In addition to being an accomplished cellist, Karen has recently ventured into the world of acting with great success. After three years as the featured cellist on “Glee”, Karen has grown quite comfortable in front of the camera. She has booked national commercial spots, spec spots and regularly performs on a Short Form Improv Ensemble at The Second City Hollywood.